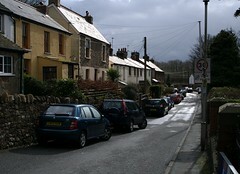 Posted by Stuart Herbert on February 19th, 2007 in Cardiff, Merthyr Road, Modern, Shoot, Shopping. View these photos as part of my Cardiff set on Flickr. It was a crazy week at work (I clocked up 56 hours last week, and I was by no means the only one), but there was still time to pop over a couple of streets to where the demolition of Bridge Street is well under way. The whole area is being cleared to make way for the St Davids 2 shopping centre complex, which is due to open in 2009. Although I’m currently looking around for a good urban landscape shot, the real aim of the shoot was to switch off from work for a few minutes and give myself a little recharge over lunch. The demolition team have erected screens around the doomed buildings. Whilst they protect the public from stray bits of rubble (and some – but not all – of the dust created by the work), the screens also prevent photographers from seeing much of what is going on. The only downside was that the car park stairwells were full of beggars and junkies obliviously shooting up. The lifts were still in working order, but I think that the safest way to do this would probably be to drive up onto the roof. If you’re trying to photograph a static subject, keep an open mind on where you can move to to find the right view. At street level, everything was obscured by the safety screens, but by finding a high vantage point, it was possible to get a much better view. The extra reach of a larger telephoto zoom is rarely needed, but there are times when nothing else will do. My Sigma 80-400mm lens takes up a lot of room in my camera bag, it’s heavy, the optical stabilisation drains the batteries on my D200 like nobody’s business, and most of the time there isn’t enough light to capture sharp images. But it stays for moments like this, when there’s only one chance of getting the shot, and I can’t get close enough to use a faster (or lighter) lens. Although I’d taken my camera in hoping that the damp conditions would improve, they didn’t. I ended up converting the photos to black and white in the hope of adding a little more depth to the images. 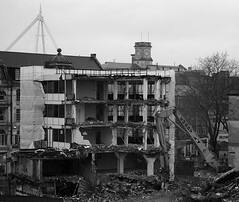 I didn’t manage to find any other photos showing the demolition work going on that I liked, but here are a few other photos of Cardiff that did make it into my Flickr Favourites. Posted by Stuart Herbert on February 11th, 2007 in Shoot. 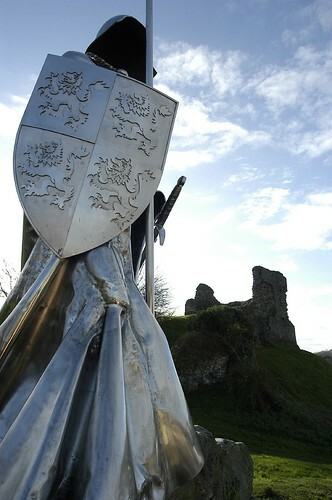 See the photos from today’s shoot as part of my Avebury set on Flickr. 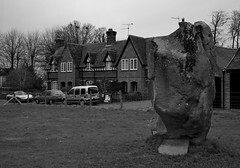 When Kristi decided to visit old University friends living in nearby Wooten Bassett, there was no way I was going to pass up the chance to spend the afternoon wandering around Avebury once more. This was only the second time I’ve visited Avebury alone; the last time was back in 1999. And I’m really glad I went, because to all intents and purposes I had the place all to myself. I’ve been to Avebury many many times over the last ten years, in all sorts of weather, and I’ve never seen the place so deserted. I think that only two of the twenty five shots I’ve uploaded to Flickr this evening have people in. I’ve been there late at night well after sunset for a spot of night photography and still seen more people. I just hope that the new car parking arrangements (which I’m definitely not a fan of) aren’t keeping people away. No matter how many times I visit Avebury (or maybe because it’s a site I’ve revisited so often! ), I always come away wishing I’d done better. This time, I was determined to make the most of the freedom of being alone to finally bag more than just the odd decent shot. Driving over from snow-bound Wales, we both thought that the blue skies and soft light were together going to make this a great trip. The weather gods obviously heard us tempting fate! By the time I got there, it had clouded over, and once the rain started it was in for the day. I have a tried and trusted trick for dealing with the British weather. Shoot everything in colour, and then convert all the shots to black and white in Aperture when I get home. You don’t get the very best shots – the light under an overcast sky is just too defuse, ruining the contrast somewhat – but by God the shots look a lot better than the colour originals. I’m still persevering with manual focus, and I’m still forgetting to use the right eye to get the focus right through the viewfinder. After ten years of shooting on autofocus, my technique’s still a bit unreliable, as you can see for yourself on this shot of a lone surviving snowman. I wish I could pick them all. For the first time, I came back with a set of twenty five photos that I’m happy with, and that do a great job of capturing what I like about Avebury. (That’s a 1 in 3 success rate. Maybe I’m not being objective enough here? 🙂 ) But, I have to choose one shot above all the others. I could stand there for hours enjoying this view of a standing stone and tree and never get bored. It’s such a peaceful spot, and I’m already looking forward to going back to the very same place later in the year to see what it looks like at sunrise and sunset. This shot of two huge standing stones and the local church comes a close second (and, I think, it’s technically the better shot), and I also really love this quirky shot of the fenced pathway just behind the Red Lion. What’s your favourite photo from the shoot? List your favourites in the comments below. The weather seals on the Nikon D200 rock. It wasn’t the wettest day of the year, but I wouldn’t have liked to have tried this shoot with my old D100. Lens cloths also rock. I didn’t lose a single image because of rains on the lens, thanks to having remembered to stuff a lens cloth in my pocket before leaving the car. I’m not sure it’s such a good idea to be staying up into the small hours just so that I can get my photos up onto Flickr and this blog entry published 🙂 But tomorrow is another day, and I don’t want to spend it finishing off the post production for today’s shoot. Posted by Stuart Herbert on February 7th, 2007 in Equipment. With my Aperture trial having run out this evening, it’s time to decide who gets my hard-earned cash – Apple, or Adobe? Both packages have a lot to commend them. Aperture is the master of organising thousands of photos. In particular, the smart albums and light tables are a real boon when sorting through a couple hundred photos at the end of the day. It’s ability to stack different versions of the same photo really opens up your creativity. The support for a “disconnected” photo library allows me to keep my masters on Moby (my paranoid fileserver at home), but still have high quality previews on the laptop when I’m out and about. Lightroom is already shaping up to be the master of adjusting your photos. It is lightning quick at this (Aperture is anything but quick, even on a top-of-the-range MacBook Pro), and it’s only a matter of time before there’s a booming third-party market in adjustment plugins. If I was making this choice twelve months or so in the future, I suspect Lightroom would be the winner. I fancy that the community that Adobe will build up around Lightroom will add an overwhelming versatility that I doubt will be matched by Aperture. Apple, by contrast, have started opening Aperture with an API for export plugins, but it feels like too little to stem the coming storm. But … I’m buying today, not next year. And I’ve really come to appreciate the way Aperture manages photos. The Lightroom betas have been really weak in this area, and the final Lightroom 1.0 (due within a fortnight) will feature a major overhaul in an attempt to provide a more realistic challenge to Aperture. Given time, I’m sure Lightroom will catch Aperture up. Until then, at least, Apple gets a little bit more of my hard-earned cash. Posted by Stuart Herbert on February 3rd, 2007 in Photos. (This is the first in a series of favourite photos chosen by other Flickr members). Nikon D100, 15mm, 1/500 sec, f/7.1. 13th November, 2004.